Half the changes in the last week were misc driver stuff (gpu, input, networking) with the other half being a mix of networking, core kernel and arch updates (mainly x86). But all of it is tiny. So at least we had one good week. This obviously was not a pleasant release cycle, with the whole meltdown/spectre thing coming in in the middle of the cycle and not really gelling with our normal release cycle. The extra two weeks were obviously mainly due to that whole timing issue. Also, it is worth pointing out that it’s not like we’re “done” with spectre/meltdown. There is more work pending (arm, spectre-v1, misc details), and perhaps equally importantly, to actually get the biggest fix for the indirect branch mitigations, you need not just the kernel updates, you need to have a compiler with support for the “retpoline” indirect branch model. because only the assembly code (not the C code) will have the retpoline mitigation. So keep that in mind. Anyway, while spectre/meltdown has obviously been the big news this release cycle, it’s worth noting that we obviously had all the *normal* updates going on too, and the work everywhere else didn’t just magically stop, even if some developers have been distracted by CPU issues. In the *big* picture, 4.15 looks perfectly normal, with two thirds of the full 4.15 patch being about drivers, and even the arch updates are dominated by the arm DTS diffs, not by CPU bug mitigation. So the news cycle notwithstanding, the bulk of the 4.15 work is all the regular plodding “boring” stuff. And I mean that in the best possible way. It may not be glamorous and get the headlines, but it’s the bread and butter of kernel development, and is in many ways the really important stuff. Go forth and play with it, things actually look pretty good despite everything. And obviously this also means that the merge window for 4.16 is open. I already have a number of pull requests pending that I will start merging tomorrow. Hopefully we’ll have a _normal_ and entirely boring release cycle for 4.16. Because boring really is good. Linux 4.14 extended memory limits to 128 PiB (Pebibyte = 1.024 Petabyte) of virtual address space and 4 PiB of physical address space, added zstd compression in Btrfs and Squashf file systems, improved kernel traces, and implemented zero-copy from user memory to socket among many other changes. Initial RISC-V Support with device tree bindings for RISC-V CPUs, early boot and initialization code, the Linux atomic and memory model intrinsics, some interrupt and timer infrastructure, paging and MMU related code, and an implementation of the user-facing ABIs for RISC-V Linux systems. Improved power management in systems with SATA Link Power Management – Because of the lack of documentation of the ALPM (Aggressive Link Power Management), and because it easily caused data corruption, Linux has been unable to properly implement ALPM support for years. Lack of ALPM support prevents the system from entering in deep power saving states, which means a much worse battery life for Linux users on systems with ALPM. This lack of implementation leads to worse battery life in systems that support ALPM, but now a patch has been merged that implements a better default behavior for ALPM without corrupting data. 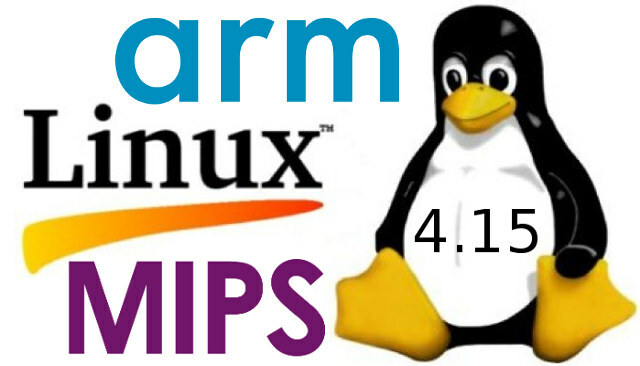 Linux users with ALPM (e.g. on Intel Haswell, Broadwell, Skylake) should see better battery life with for example Thinkpad T440s laptop saving 0.9-1.2W when idle. User-Mode Instruction Prevention Intel Security feature – Spectre/Meltdown was not the only security issue addressed in Linux 4.15, and the release also added support for “User Mode Instruction Prevention” found in Intel processor, that disable some instructions ( SGDT, SLDT, SIDT, SMSW and STR) from being executed in user mode in order to reduce the tools available to craft some type of privilege escalation attacks. Enablement of display support on the rk3399-firefly, which got its default serial set as well and got cec support as well. Gru boards got their touchpad support refined to actually mark the button correctly and also git their rt5514 dsp added. CEC support for the two rk3288-firefly variants and general hdmi support for the firefly-reload. Vyasa from Amarula Solutions using a rk3288 and core LVDS node for the newly added driver+binding. bindings + nodes for the Mali-Utgard GPUs found on some Rockchip socs like RK3036 and RK3188. (Lima project can render a red triangle to a png file). Minor drivers cleanups, e.g. remove of Exynos4212 related dead code (no more support for this SoC). Add new board: Hardkernel Odroid HC1. Fix incomplete Odroid-XU3/4 thermal-zones definition leading to possible overheat if first pair of A7+A15 cores is idle but rest of CPUs are busy. Add capacity-dmips-mhz properties for CPUs of octa-core SoCs. Add power button to Odroid XU3/4. Improvements in Gscaler, HDMI and Mixer blocks on Exynos5. Add suspend quirk to DWC3 USB controller to fix enumeration of SuperSpeed devices on Odroid XU4. Add HDMI and MHL to Trats2. Cleanups (redundant properties and nodes). Enable USB3503 on multi_v7 for Odroid U3. Enable USB Attached SCSI for Odroid HC1. For full details, check out the full Linux 4.15 changelog – with comments only – generated using git log v4.14..v4.15 --stat. You may also consider reading Kernelnewsbies’s Linux 4.15 changelog.